If you’re turned off by gushing reviews, you should stop here because I set the gush factor to HIGH on this one. I’ll be the first to admit that I am often apprehensive about self-published books. The majority of those that I have read needed a lot of work. (I’m sorry if that makes me sound like a snob, but you never know until you dive in head first.) However, Angelfall is a prime example of why indie should never go ignored. This is one of those gems that I would never want to overlook, and quite frankly, is it marginally better than the majority of the raved-about traditionally published books that I’ve read recently. The first thing I noticed was the writing. It’s imaginative and at times gruesome, and I absolutely loved it. It’s perfectly polished, and brilliantly paced. Note that there are parts that may not be ideal for a weak stomach, but they didn't bother me personally. I think this is one of the aspects of independent publishing that absolutely works in the author’s favor. She can push these limits without someone standing over her shoulder telling her it’s too dark, and in this case, it works so well for the story. There wasn’t a moment of boredom for me, or even a scene that slowed down the momentum of the story. Penryn is an awesome and incredibly tough heroine. There is something great about a female character that can take care of herself. She’s witty and full of determination. She never loses sight of what is important. At some point in the book a vaguely recall wanting to complain about something she had done or said, but I didn’t make note of it, and apparently my love for the story outweighed it because I can’t remember. Ha. (I’m not a big fan of her name but that has nothing to do with her characterization) I loved Raffe as well. He’s dark and amusing, all the while doing his best to hold onto his convictions. He never does anything to lead Penryn into thinking something she shouldn’t, despite his inner turmoil. I admired that. The way their relationship was handled is perfect. Having bought the book for only 99 cents (and you should too), I feel like I ripped the author off because it is worthy of much more than that. I did not want to put this book down. I was literally on the edge of my seat, anxious to find out what happens next, but I also didn’t want it to end. I hope this author’s sales go through the roof. I hope this book goes viral. Susan Ee and Angelfall deserve it, and I cannot wait until the sequel is released. Do I even need to say it? 5 stars! Oh my god I'm so glad to see this one getting the attention that it deserves! Can you believe she tried to get a publisher and has been getting declined!? Are they reading the same book? Haha I mean, this is going to be a hit if it ever gets published! So happy you loved this too! Great review. I haven't heard of this before, but now that I do I am adding it to my TBR list. For 99 cents I need to get it now. This is a new book to me, but it sounds amazing. I really enjoyed your review. It is getting added to my list. You just made want me buy this book now even though I'm getting ready for bed! I'm all giddy now! Sounds like an amazing book,I like that it sounds gritty and dark. I need to add this book to my TBR list. I agree the name is definitely different, not even sure how to say it. Which means I come up with my own version of what it should be. It's funny, because I LITERALLY just finished typing up my review of this book when I came across yours. Why my review probably doesn't quite hit the gush factor yours did, I definitely enjoyed the book, and I'd agree: more than worth the 99 cents I paid for it! I just read this one recently too. It was amazing. I've recommended it to several friends and they loved it as well. I agree with you on all points, except I actually loved Penryn's name. Great review. Woh! Five stars??? I'll have to check this one out. I'm usually hesitant about self published books too but this sounds really good! Thanks! The plot sounds very intriguing. Will definitely have to check it out with the great review you gave! I came across this on my search through amazon a week ago and I just added it to my wishlist. Cannot believe I overlooked it. It sounds amazing and I will be rushing right back to buy it!!!! I am definitely adding this one to my tbr list. I usually don't read indie books, but I think you've changed my mind. Plus, you can't beat a .99 book. 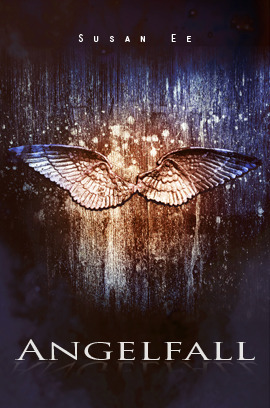 I've read a couple angel books, definitely a genre I would like to read more of. This is so hard about self-published works. It is so hit and miss and most of the time it's a miss. Thanks for the review! I'll add this one on my tbr list. Ooooh this sounds awesome! Thanks for the great review, I'm soooo putting this on my wishlist! This is the first review I've seen for Angelfall and I was wondering how it was. I'm so glad to hear something about it! Thanks! This is not a very well known book, but I have heard that it is great so I want to read it! I loved this book as well! I'm so happy that people are praising it because it totally deserves it!